Stretching down into the depths beneath Waterloo station, your path lined with layers of graffiti lovingly enhanced by generations of hooded youths, you will find a place which is not, as you might on first glance think, an overflow junk yard for Network Rail, but an additional performance venue for the Old Vic theatre: a place where shows can be staged underneath the railway arches; a place where damp and electricity appear to coexist on peaceful terms. 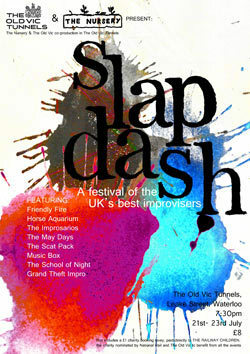 The venue is currently being used to stage Slapdash, a show incorporating some of the best groups of improvisers in the UK, brought together under one tunnel for the very first time. Slapdash comprises various sketches, all based on the words, phrases or genres thrown out by the audience and taken on by one of the improvisation groups performing that evening. The result is an eclectic mix, with subjects ranging from ‘Shakespeare 2.0’ to ‘Fox’ to ‘my syphilitic granddad’. The show rests heavily on the quick-thinking ability of the cast to react to whatever is slung at them, not only by the audience, but by their own colleagues who may well be working along drastically different plot lines. The groups accomplish this with panache, wit and an impressive degree of professionalism, despite acting out, at various points, anything from a platypus to Ernest Hemingway with an inappropriate interest in the bovine species (one of those you-needed-to be-there anecdotes). The evening ranges from the hilarious and the inspired to the downright odd; forcing the audience to oscillate between hysterical laughter and a bewildered anticipation of what might happen next. For those who have never seen improvisation before, you are, as a minimum, guaranteed never to see the same thing twice. Read our review of Ditch in the Old Vic Tunnels, back in May.